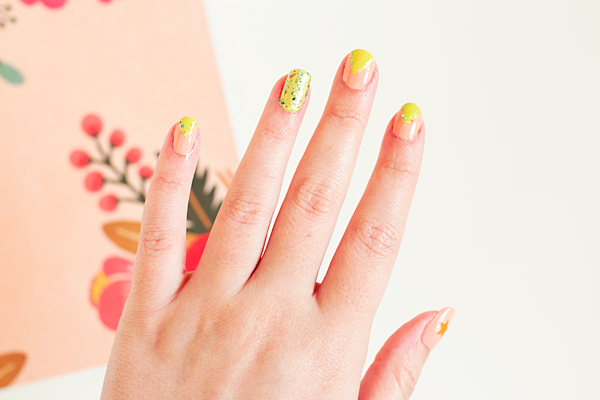 Summer is officially over but that doesn't stop me from wanting to paint my nails with bright cheery colours. 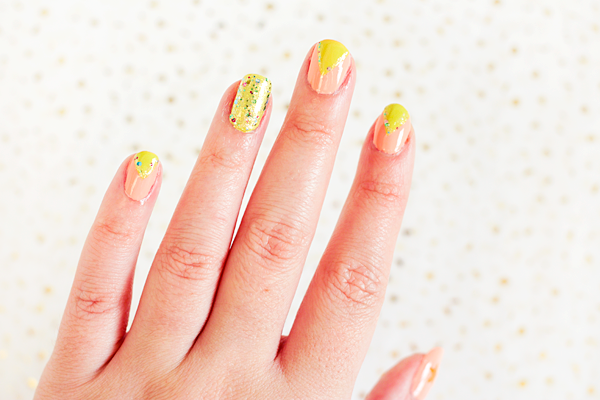 To wrap up the season Essence challenged me to come up with the perfect Summer manicure. They sent me a little goody bag filled with a nail file, three different nail polishes, nail art stickers & some nail art tools to use in my designs. Having never tried any of their nail polishes before I wasn't sure what to expect but the quality is outstanding. I really love the three nail polishes I received. The formula of the green gel nail polish (27 Don't Be Shy) is incredible & it looks super shiny even without a top coat. For a gel polish the price can't be beaten. I'm definitely going to buy a few more of these! 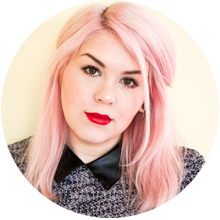 I think that the pastel peach polish (03 I'm So Fluffy) looks adorable & it has quick-dry matte finish. I can't resist a bit of glitter on my nails & the glitter effect nail polish (20 Hidden Garden) goes perfectly with the green gel. After playing about with the colours I decided to do some triangular nail art. This would allow me to incorporate all three nail polishes in my designs & it looks really effective despite being quite a simple pattern to do. First of all I shaped my nails using the Studio Nails Sweet Mini File. It has a slight lemony scent to it which is pretty cool but I much prefer my Only Fingers + Toes Glass Nail File. Next I applied a layer of the Sally Hansen Maximum Growth Base Coat to prep them for colour. I applied two coats of I'm So Fluffy to all of my nails apart from the ring fingers. I used one coat of Don't Be Shy & one coat of Hidden Garden on my ring fingers as accent nails. To create the triangle shapes I cut pieces of sellotape in half & placed them diagonally across my nails. It's very important to make sure that the nails are completely dry at this point or the sellotape can mess them up. I painted the spaces in between with Don't Be Shy & peeled off the sellotape while the polish was still wet as this allows you to get sharper lines. I then took the striping brush from the Nail Art Designer Set & applied thin lines of the glitter polish along the edges of the triangles. 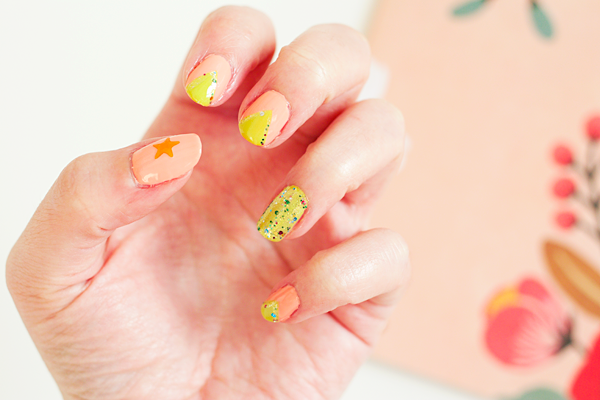 I also wanted to use some of the Neon Nail Art Stickers as the designs are really cute. 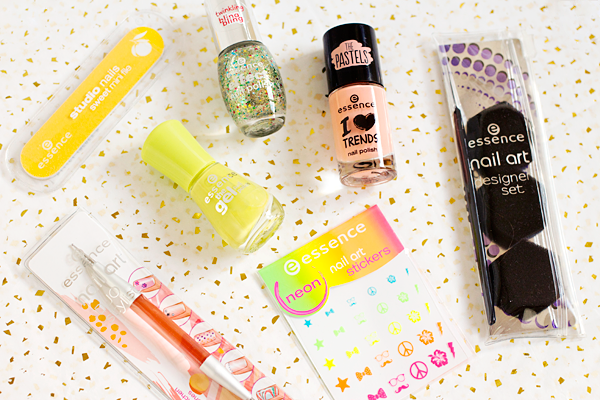 Stickers like these are such a quick & easy way to jazz up your manicure. It's just a shame that they come in all different colours & sizes as I like symmetry. I popped the orange star on one thumb & the orange peace sign on the other. Finally I used my Mavala Mavadry Top Coat to seal everything together & give the nails a glossy finish. So what do you think of my nail art? 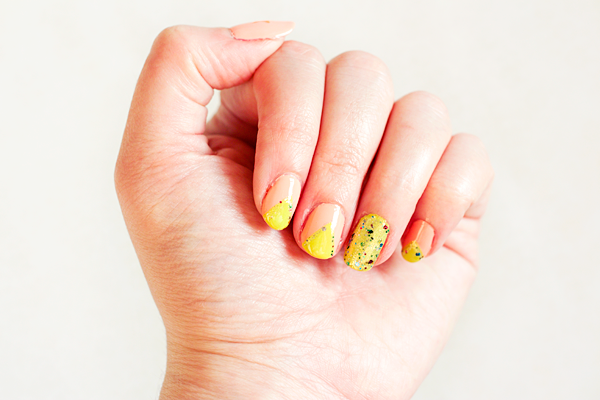 I'm actually really happy with how my Summer manicure turned out! The colours look so pretty together & the glitter accents definitely make the design a bit more special. This was my first experiment with triangular nail art & I really like the effect so I plan on trying out something similar in the near future. All of the Essence products in this post are available to buy at Wilko, both in store & online. I love the design and the colors and I don't mind if it isn't summer I still love bright colors. For summer time it is fine how about other seasons? Can you share that one too.